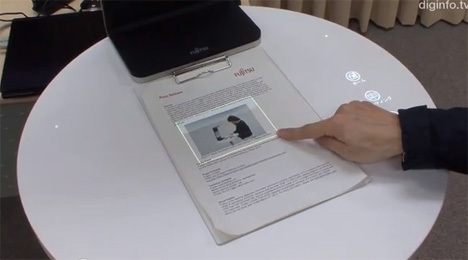 Fujitsu Laboratories‘ new user interface effectively makes any surface into a touchscreen. 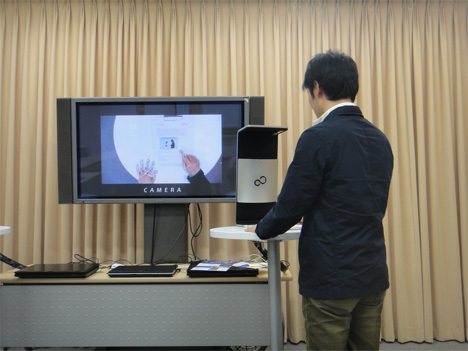 The system uses relatively simple hardware: an ordinary webcam and a commercial projector. Image processing technology lets you select text from a real-world document and digitize it, effectively using your fingertip as a next-generation scanner. The system doesn’t respond to regular activities on the table or whatever surface you’re using it on. It would react to the pointing of a fingertip which, according to Fujitsu, is an effective combination of analog operations and digital devices. Users can also manipulate the system with gestures, which would make it much more useful in a variety of applications. It’s surprisingly adept and able to detect differences in ambient brightness, skin color and fingertip height. 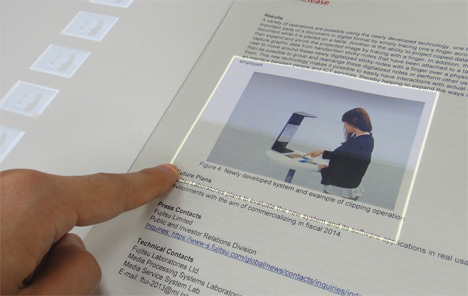 It can also adjust for differences in surfaces, such as the curved surface of an open book’s page. Fujitsu is planning to market the system as an all-around interface which could be used to digitize analog data, make presentations or file paperwork at the courthouse. They are planning to develop a commercial version of the technology for fiscal year 2014, but significant user testing is required before it’s ready for the market. See more in Futuristic or under Technology. May, 2013.